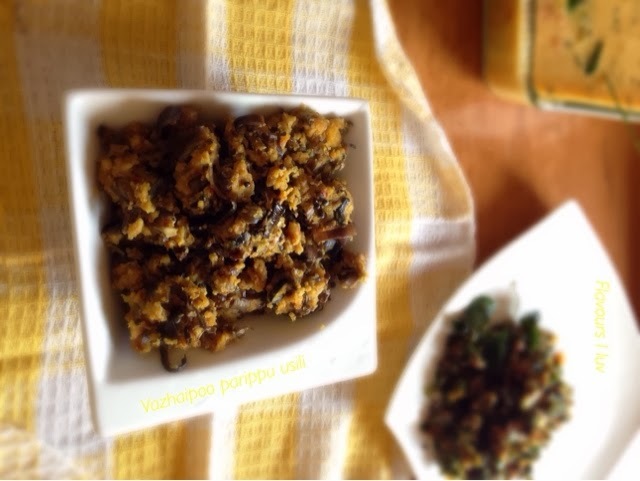 Parippu usiili is a traditional South Indian ( Tamil ) side dish prepared with lentils and vegetables. Usually parippu usili is made with vegetables like cabbage, beans and banana flower. This is very popular among Tamil Brahmins. Remove the outer petal and you can see a bunch of florets inside. Take the florets and remove the stamen and the small cover along with it. Chop the florets after removing the stamen and the white cover and discard the bottom portion. 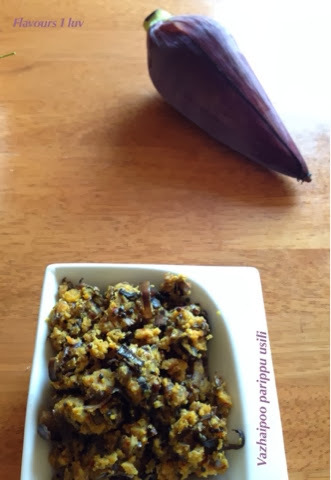 Keep the chopped plantain flower in diluted butter milk to prevent discoloration. Soak the chana dal, toor dal, dhania ( coriander seeds ) and red chillies for 15-20 minutes. Drain the water and coarsely grind this in a mixer. Steam this in a greased idli plate or a normal vessel for 15 minutes. When done allow this to cool and pulse it in a mixer. In a pan add oil and splutter mustard seeds. Add drained vazhaipoo and sauté this for 5 minutes by adding salt to this. The vazhaipoo will get cooked easily. Take it out from the pan and keep it aside. Add oil in the same pan and add the steamed and pulsed dal. Add little salt and turmeric powder. Sauté well in a low flame for 5 minutes till it gets nicely roasted. Now add the vazhaipoo which we have cooked already. Mix well and let it cook in a low flame for 2 minutes. Vazhaipoo parippu usili is ready to serve. Usili looks awesome..we too make something similar. You have a nice blog! Happy to follow you, do visit my space too.